Reading and share top 208 famous quotes and sayings about Reverence by famous authors and people. Browse top 208 famous quotes and sayings about Reverence by most favorite authors. 2. "God will not hold us responsible to understand the mysteries of election, predestination, and the divine sovereignty. The best and safest way to deal with these truths is to raise our eyes to God and in deepest reverence say, "0 Lord, Thou knowest." Those things belong to the deep and mysterious Profound of God's omniscience. Prying into them may make theologians, but it will never make saints." 3. "Centuries of secularism have failed to transform eating into something strictly utilitarian. Food is still treated with reverence...To eat is still something more than to maintain bodily functions. People may not understand what that 'something more' is, but they nonetheless desire to celebrate it. They are still hungry and thirsty for sacramental life." 4. "Let's think of reverence as awe, as presence in and openness to the world…Try walking around with a child who's going, ‘Wow, wow! Look at that dirty dog! Look at that burned-down house! Look at that red sky!' And the child points, and you look, and you see, and you start going, ‘Wow! Look at that huge crazy hedge! Look at that teeny little baby! Look at the scary dark cloud!' I think this is how we are supposed to be in the world – present and in awe." 5. "Worship means reverence and humility it means revering your real self and humbling delusions." 7. "How I treat a brother or sister from day to day, how I react to the sin-scarred wino on the street, how I respond to interruptions from people I dislike, how I deal with normal people in their normal confusion on a normal day may be a better indication of my reverence for life than the antiabortion sticker on the bumper of my car." 8. "When we must pay the true price for the depletion of nature's gifts, materials will become more precious to us, and economic logic will reinforce, and not contradict, our heart's desire to treat the world with reverence and, when we receive nature's gifts, to use them well." 9. "LET us honour the King by cherishing respectful Sentiments concerning him; speaking of him with Affection, with Esteem and Reverence; and by promoting a like Spirit and Conduct in others." 10. "He really wanted to remain angry, but somehow he had come to believe that women were wondrous, mysterious, and magical creatures who should be treated not only with respect but with reverence and even awe. Perhaps it was something that his mother used to say to him. She would say, "Lucien, women are wondrous, mysterious, and magical creatures, who should be treated not only with respect but with reverence, perhaps even awe. Now go sweep the steps." 11. "The mind unlearned in reverence, says Bonaventure (1221–1274), is in danger of becoming so captivated by the spectacle of beings as to be altogether forgetful of being in itself; and our mechanistic approach to the world is nothing but ontological obliviousness translated into a living tradition." 12. "It is not the reverence for words, but for their meaning that determines our deepness of comprehension of a given assertion about Nature." 13. "I am an inveterate buffoon, and been from birth up, your reverence, it's as though it were a craze in me. I dare say it's a devil within me. But only a little one. A more serious one would have chosen another lodging." 14. "Pale hair fell in waves to his shoulders, framing a face mortal females considered a sensual feast. They didn't know the man was actually a devil in angel's skin. They should have, though. He practically glowed with irreverence, and there was an unholy gleam in his green eyes that proclaimed he would laugh in your face while cutting out your heat. Or laugh in your face while you cut out his heart." 15. "Ruins and basilicas, palaces and colossi, set in the midst of a sordid present, where all that was living and warm-blooded seemed sunk in the deep degeneracy of a superstition divorced from reverence; the dimmer but yet eager titanic life gazing and struggling on walls and ceilings; the long vistas of white forms whose marble eyes seemed to hold the monotonous light of an alien world—all this vast wreck of ambitious ideals, sensuous and spiritual, mixed confusedly with the signs of breathing forgetfulness and degradation…the vastness of St. Peter's the huge bronze canopy, the excited intention in the attitudes and garments of the prophets and evangelists in the mosaics above, and the red drapery which was being hung for Christmas spreading itself everywhere like a disease of the retina." 16. "Yes! thank God; human feeling is like the mighty rivers that bless the earth: it does not wait for beauty - it flows with resistless force and brings beauty with it. ... There are few prophets in the world; few sublimely beautiful women; few heroes. I can't afford to give all my love and reverence to such rarities: I want a great deal of those feelings for my everyday fellow-men, especially for the few in the foreground of the great multitude, whose faces I know, whose hands I touch, for whom I have to make way with kindly courtesy." 17. "Until we consider animal life to be worthy of the consideration and reverence we bestow upon old books and pictures and historic monuments, there will always be the animal refugee living a precarious life on the edge of extermination, dependent for existence on the charity of a few human beings." 18. "If you see a philosopher determining all things by means of right reason, him you shall reverence: he is a heavenly being and not of this earth." 19. 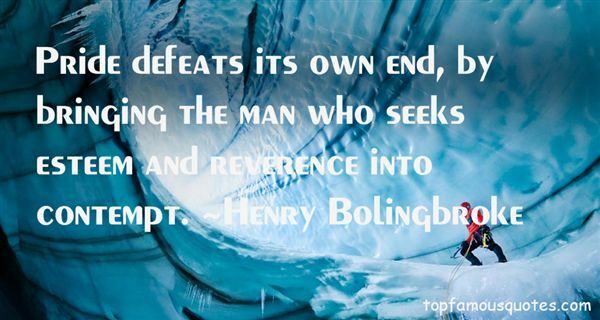 "Pride defeats its own end, by bringing the man who seeks esteem and reverence into contempt." 20. "I found in myself, and still find, an instinct toward a higher, or, as it is named, spiritual life, as do most men, and another toward a primitive rank and savage one, and I reverence them both. I love the wild not less than the good." 21. "I feel a kind of reverence for the first books of young authors.There is so much aspiration in them,so much audacious hope and trembling fear,so much of the heart's history, that all errorsand shortcomings are for a while lost sight ofin the amiable self assertion of youth." 22. "Instinct and study, love and hate;Audacity-reverence. These must mate,And fuse with Jacob's heart,To wrestle with the angel -- Art." 23. "The eyes were hollow and the carven head was broken, but about the high, stern forehead there was a coronal of silver and gold. A trailing plant with flowers like white stars had bound itself across the brows as if in reverence for the fallen king, and in the crevices of his stony hair yellow stonecrop gleamed. "They cannot conquer for ever!" said Frodo." 24. "Whisper sweetly the tenderness of the moment. Let the love teach you the true meaning and passion of this experience we share. With gratitude and reverence for the blessings and miracles I receive and witness, my heart still beats as the little things die to be reborn with a greater joy for life in each moment." 25. "The study of history requires investigation, imagination, empathy, and respect. Reverence just doesn't enter into it." 26. "Tyler." She looked up at him. "This is blasphemous. "He couldn't resist the heat of his desire, not with her mouth wet with rain and his kiss. Her neck and breasts were beaded with drops while the soft pinkness of her flesh showed through the cotton dress. Lovely, natural. "This isn't sin." He managed the words in a voice thick with want. "It's sacred. Everything I do with you, every touch, every kiss, every word murmured in reverence against your flesh, is sacred. And you're cold. I want to warm you." 27. "We are enjoined whenever we behold the gifts of God in others so to reverence and respect the gifts as also to honor those in whom they reside." 28. "There is a relentless search for the factual and this quest often lacks warmth or reverence. At a certain stage in our life we may wake up to the urgency of life, how short it is. Then the quest for truth becomes the ultimate project. We can often forage for years in the empty fields of self-analysis and self-improvement and sacrifice much of our real substance for specks of cold, lonesome factual truth. The wisdom of the tradition reminds us that if we choose to journey on the path of truth, it then becomes a sacred duty to walk hand in hand with beauty." 29. "What is sin?It is the glory of God not honored.The holiness of God not reverenced.The greatness of God not admired.The power of God not praised.The truth of God not sought.The wisdom of God not esteemed.The beauty of God not treasured.The goodness of God not savored.The faithfulness of God not trusted.The commandments of God not obeyed.The justice of God not respected.The wrath of God not feared.The grace of God not cherished.The presence of God not prized.The person of God not loved.That is sin." 30. "Right now my mind is on the people who stole our instruments, and, specifically, the person with my guitar, which will no doubt end its days having Green Day songs worked out on it. A better fate was deserved - and while the reverence given to guitars annoys me, I shall miss it." 31. "Our relatedness with other living forms provides us something we sorely need: a reverence for the life of all creatures great and small, and an expanded view of our place in nature–not as rulers over it, but as participants in it." 32. 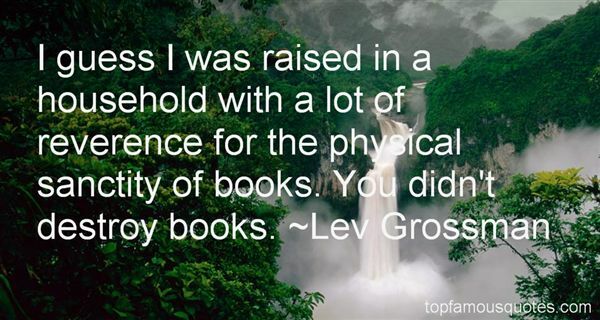 "I guess I was raised in a household with a lot of reverence for the physical sanctity of books. You didn't destroy books." 33. "True spirituality makes you loving and grateful, and forgiving, and patient, and gentle, and long-suffering. True spirituality breathes reverence into every act and deed." 34. "Mark Twain, cynical about so much else, has a particular reverence in the Holy Land for "sitting where a god has stood". What flabbergasted him was that his traveling companions would be in such a sanctified environment and winter what they saw according to other writers or their denominational background instead their own experience with the holy." 35. "Allow me now to return to the cottagers, whose story excited in me such various feelings of indignation, delight, and wonder, but which all terminated in additional love and reverence for my protectors (for so I loved, in an innocent, half painful self-deceit, to call them)." 36. "Dread lord and cousin, may the almighty preserve your reverence and lordship in long life and good fortune." 37. "It may be considered folly by common opinion but this refusal to destroy life unnecessarily, this reverence for it, must become a deeply implanted part of his ethical standard." 38. "Let parents then bequeath to their children not riches but the spirit of reverence." 39. "Apart from being celebrities, there's a huge amount of respect associated with being cricketers and a certain amount of reverence and honour associated with representing India. In people's eyes, apart from other celebrities in India, I think for sportsmen in India there's a certain amount of regard." 40. "And be careful of this, that each day at your meals you have two overseers over your household when you sit at meals, and of this be sure, that you shall be very much feared and reverenced." 41. "Lying has a kind of respect and reverence with it. We pay a person the compliment of acknowledging his superiority whenever we lie to him." 42. "Blanche:No, I have the misfortune of being an English instructor. I attempt to instill a bunch of bobby-soxers and drugstore Romeos with a reverence for Hawthorne and Whitman and Poe!" 43. "Some men look at constitutions with sanctimonious reverence, and deem them like the ark of the covenant, too sacred to be touched. They ascribe to the men of the preceding age a wisdom more than human, and suppose what they did to be beyond amendment...But I know also, that laws and institutions must go hand in hand with the progress of the human mind. As that becomes more developed, more enlightened, as new discoveries are made, new truths disclosed, and manners and opinions change with the change of circumstances, institutions must advance also, and keep pace with the times." 44. "Most men claim to desire driven, independent and confident women. Yet when confronted with such a creature reverence often evolves into resent. For just like women, men need to be needed." 45. "Karhiders discuss sexual matters freely, and talk about kemmer with both reverence and gusto, but they are reticent about discussing perversion - at least they were with me. Excessive prolongation of the kemmer period, with permanent hormonal imbalance toward the male or the female, causes what they call perversion; it is not rare; three or four percent of adults may be physiological perverts or abnormals - normals, by our standard. They are not excluded from society, but they are tolerated with some disdain, as homosexuals are in many bisexual societies, the Karhidish slang for them is halfdeads. They are sterile." 46. "In my view, it's irreverence, foolish confidence and naivety combined with persistence, open mindedness and a continual ability to learn that created Facebook, Google, Yahoo, eBay, Microsoft, Apple, Juniper, AOL, Sun Microsystems and others." 47. "What one means by integrity, in the case of the novelist, is the conviction that he gives one that this is the truth. . . . When one so exposes it [integrity] and sees it come to life one exclaims in rapture, But this is what I have always felt and known and desired! And one boils over with excitement, and, shutting the book even with a kind of reverence as if it were something very precious, a stand-by to return to as long as one lives, one puts it back on the shelf." 48. "Spring passes and one remembers one's innocence.Summer passes and one remembers one's exuberance.Autumn passes and one remembers one's reverence.Winter passes and one remembers one's perseverance." 49. "So...Now that we got that over with, let's get back to love at first sight, Evan said. Not infatuation at first sight...Love. With a capital L, he clarified.Love? Heeb asked, playfully pretending not to know the concept.Yeah. The real thing. The conviction that if you had this one woman, all other women would become irrelevant. You'd never again be unhappy And you'd give up anything to have her and keep her.You've experienced that?Only once. And I haven't stopped thinking about it ever since.Tell me more.Sometimes I think that I still chase women just to forget about her. Because I know I can never have her. But I can't seem to forget about her, no matter what girl I'm chasing...No one can possibly compare....Who is she?Delilah, Evan said wistfully.Delilah?, asked Heeb, intriguedDelilah Nakova, Evan replied, with a hint of awe and reverence in his voice." 50. "If the traditional Rs (reading, writing, and arithmetic) are the basics that we want our children to master academically, then reverence, respect, and responsibility are the three Rs that our children need to master for the sake of their souls and the health of the world." Two years away. To an Incarnate, it's nothing. But when you have people who care about you, who you're excited about, each day becomes significant."